I have to report that we sold the family lodge up in the White Mountains of New Hampshire. Which means I will probably be making fewer trips up there in the future. Which also means fewer opportunities to check in on my favorite spot – the view of Mount Chocorua across Chocorua Lake as seen from Tamworth, NH. Lucky for us, it is a favorite spot of many people so we can still check in from time to time. 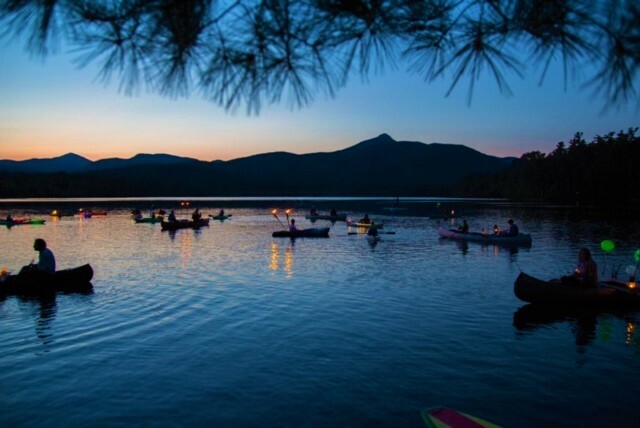 Like this great picture of a special dusk event held on the lake recently. Sorry no photo attribution but I thank the photographer for this great shot. Lost Cowboy is powered by	WordPress 5.0.4 and delivered to you in 0.734 seconds using 45 queries.